We are always happy to have The Pines cater our events and received great feedback as well. We are already looking forward to next year! The food was AMAZING everyone LOVED it. We had several comments on how delicious the salmon was! Thank you for all your help with our Annual Dinner. The food was awesome! I’ve heard a lot of great comments. I appreciate all you do for us. We always enjoy having you guys here because we know everything will run very smoothly and the food is excellent! It was a big hit once again! We truly appreciate the time and effort that goes into catering our Christmas dinner each year. Great food and excellent, friendly service certainly makes it a wonderful experience! 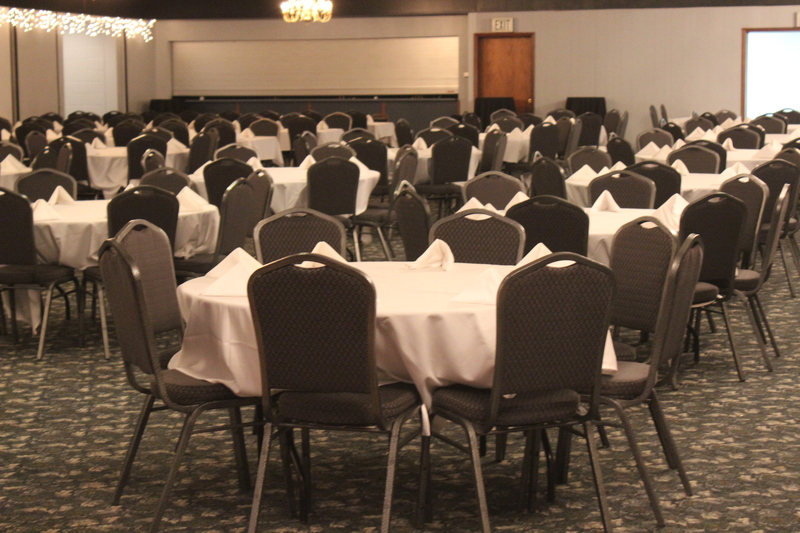 The Pines catering and banquet service is hardware equipped to provide stellar service from groups of fifty to thousands of guests. Our professional catering staff is trained to take the worry out of planning your gathering. Remember a thing called trust? It’s that feeling of absolute security that comes from knowing that there’s someone to take care of you. In a world where it’s hard to know who you can trust, it’s refreshing to know there’s a catering service that not only knows what trust means – but will actually earn yours. With a rich tradition of quality catering, The Pines will work with you to create and execute an impressive corporate event that reflects your company’s image. No matter if you are planning a gathering in the boardroom or in the corporate dining room – our seasoned experts can assist you right down to the last detail so that nothing is left to chance. From casual business luncheons and banquets to sit-down dinners, choose from The Pines vast selection of top-quality beverage and menu options. Our winning presentation and impeccable service are sure to make your next corporate event a complete success. The Pines Catering Service offers superior event planning that is tailored to your tastes and budget. From reunions and receptions – to alumni banquets, church or holiday dinners, and political rallies, The Pines catering services will exceed your expectations with extraordinary cuisine, exceptional even execution, and impeccable customer service. Our experienced staff will work with you to create a custom menu as unique as your event. Whether you are planning a wedding, banquet, special event or corporate luncheon, you can trust The Pines Catering and Banquet Service. We are much more than a family restaurant! 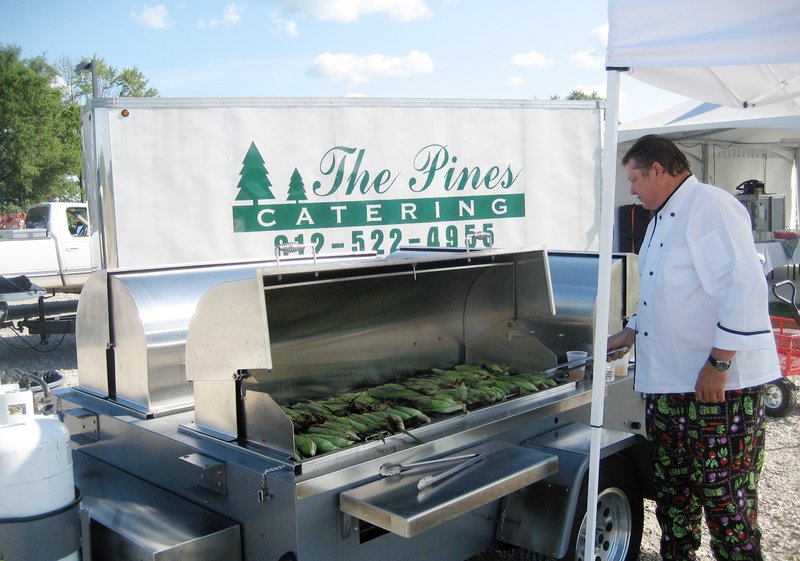 The Pines Catering and Banquet Service is equipped with catering trailers, trucks, a newly acquired concessions trailer and an arsenal of catering hardware. Our professional staff is trained to exceed the expectations of groups from fifth to thousands of people. We are experts in cook/transport foods as well as on sight cooking. Our catering department is in constant motion catering events that are sometimes miles and miles from home. You never know where you might see The Pines Catering trucks and staff. We know how to take the worry out of planning your next event. Just give us a call at 812-522-4955 and tell us your plans. We’ll do the rest. What is considered a “catering”? We arrive in a fully stocked support vehicle allowing plenty of time for set-up and stay throughout the 2-hour meal service.We provide all hardware, serving utensils, labor for maintaining food line(s), and beverage station. We provide table coverings for the food line(s) and beverage station. Our experienced staff is appropriately dressed, courteous, and professional. When arriving on site, we are self-sufficient in the fact that we do not need a kitchen facility to prep foods. Can you do outdoor events? Absolutely! Mike and his cook team thoroughly enjoy the outdoors. We currently have a small, one box pull behind the grill that we use for parties for less than 100 guests. We have a larger three box pull behind that gives us the opportunity to serve thousands with our on site capabilities. A large deep fryer is often used on site for our “Proper Southern Fish Fry”, which has become quite popular for our outdoor events. We also carry tents for our serving lines and cook station if needed. Do you have the ability to do concessions? Concessions bring happiness to ANY gathering. We do offer cotton candy, popcorn, snow cones and ice cream bars. Can we rent additional linens for our event? We can provide linen tablecloths for dining tables/brides table/display tables etc. Arrangements can be made for linen pick up ahead time for the day before venue set-up/decorating. We have a large stock of white table skirting. White skirting gives an elegant look to brides table, gift table, food table, cake table, etc. Each skirt is 21 linear feet. We can give you a close estimate and quote your needs. Chair cover and ribbons are also added that makes a beautiful statement to a room. These can also be quoted per chair. Can I upgrade my dinnerware? All meals quoted using high quality heavy-weight disposable black dinnerware. For an additional $2/person we provide white melamine plates and reflections disposable silverware. If you are interested in china dinnerware, for an additional $5/person we provide real salad plates, dinner plates, a real knife, fork, spoon, Lexan tumbler. Also with this upgrade, we provide servers on the dining room floor, delivering beverages to the guests at the tables. Can you provide bar service for my wedding reception at another venue? What’s a reception without the alcohol? The Pines catering staff has well-trained bartenders that can maintain a bar service for your event. We are licensed and insured to provide this service to our customers. We have several packages that include beer only, beer and wine only and a full-service bar that includes top shelf liquors. Our event coordinator can help you with these decisions and pricing. Interested in having us cater an event? Contact us!